God blocks us when we need to be blocked. Saul, which Paul was knows as before his conversion, was on the way to Damascus to kill more Christians. 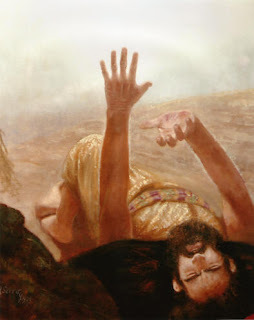 God had great plans for Saul, but He had to break him first. Saul was definitely on the wrong track and Jesus did something about it. Sometimes when you’re on the wrong path Christ has to intervene. God sees and knows all the magnificent things you could do if you would just listen to Him. When He sees you going the wrong way sometimes He breaks you down. However, this is never to keep you down. God only wants you to realize your full dependence on Him. Today God has really taught me on depending on Him and this adds another nail to it. He is aware of what He's letting us go through and we only need to fully trust Him; anyway He created us! He says "Be still, and know that I am God" Psalms 46:10. Thanks Armstrong, God bless you!